I'm a Rock Star Fishie! OK, I know some of you may be wondering.....what the heck is a Rock Star Fishie? Or maybe you're saying to yourself...A Rock Star Fishie? What? How did SHE get to be a Rock Star Fishie??? Well, if you've heard of Amanda Herring of The Quilted Fish, chances are, you know what a Rock Star Fishie is! Amanda loves her customers, supporters, and fans, and wants to show off what all of us are making out of her fabric. And this month I'm one of the Rock Star Fishies featured on her blog The Quilted Fish. I absolutely love working with her fabric! Her latest line is Madhuri, and I jumped at the chance to use this fabric when Kelli at Seriously..I think it needs stitches asked me to test her Mod GeoCruiser pattern. Each featured Rock Star Fishie receives a special necklace, and Amanda will send out a piece of fabric to each Rock Star to sign. Once she has received them, she will start making a quilt out of them. I love that! It's not too late to become a Rock Star Fishie, so just head over to Amanda's blog and check it out! 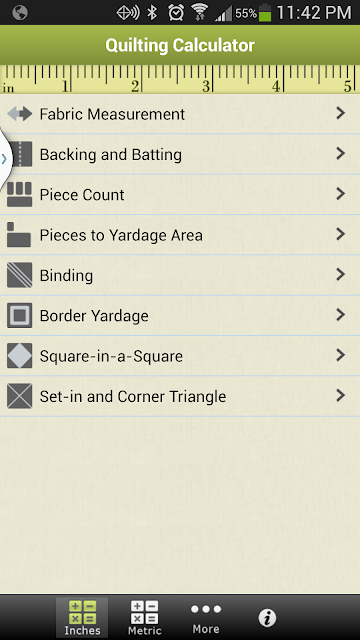 Do you have any favorite quilting apps? I recently switched from an iPhone to a Droid and was afraid that I might not be able to use my favorite quilting app - Robert Kaufman Quilting Calculator. I can't tell you how many times I've used this! And my international friends will be happy to know that it can be switched to metric! Another favorite is the Joann's app. 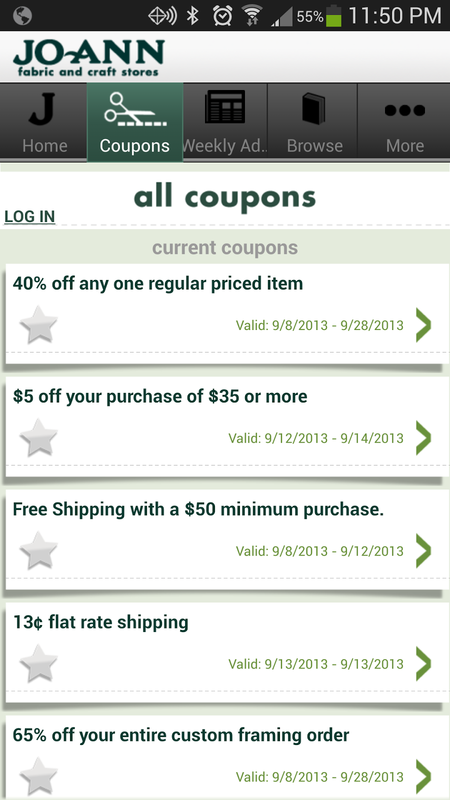 You can view the weekly ad, search for locations, or most importantly, view all available coupons! WHAT? That's right, just show your app to the cashier, and they can scan it! And you can use these in addition to the ones that you receive in the mail! If you have any favorite quilting apps that you'd like to share, I'd love to know about them! 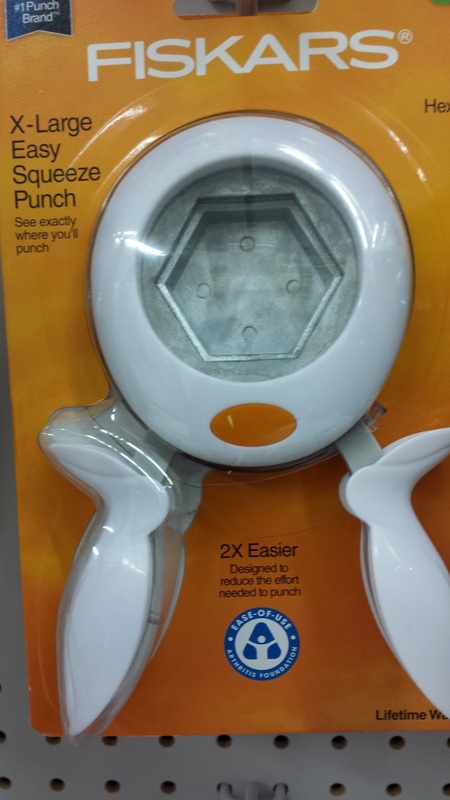 Have you see this Fiskar's Hexagon Paper Punch? It makes the perfect 1" hexies (1" measured from point to point down each side) This is making my hexie cutting so much easier and so much more fun!! I got it at Joann's and it was 40% off! Woot! Oh, and I must thank Caroline at Trillium Design for the tip! 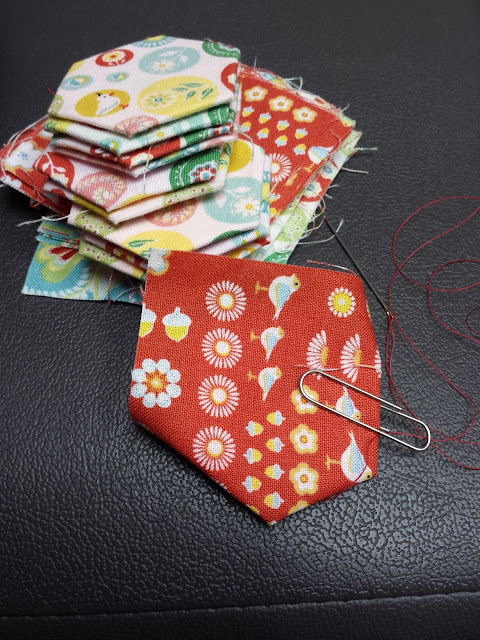 I'm still making lots of hexies with my Hideaway fabric and just found another online source for ordering more - Missouri Star Quilt Company. I got a little of each of the ones they had available. 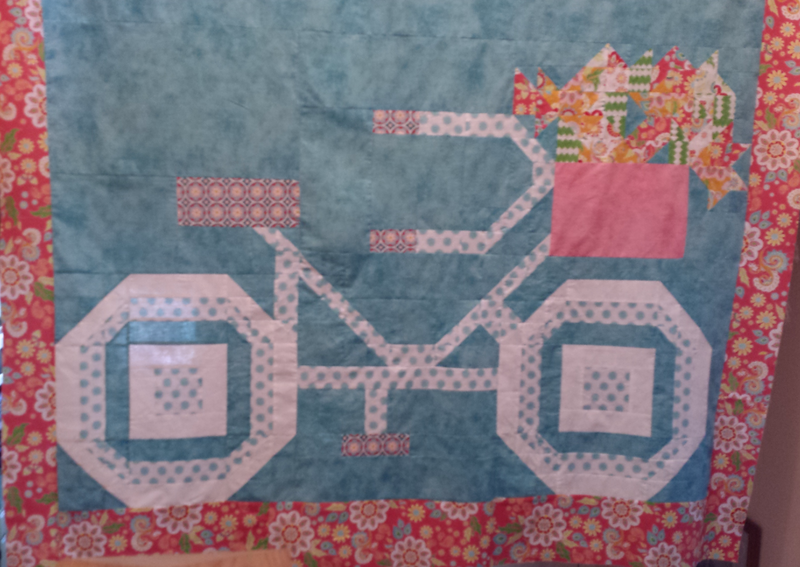 This is going to be such a fun quilt when I get it all put together.....one of these years. Don't you just love the little birds and acorns and flowers? 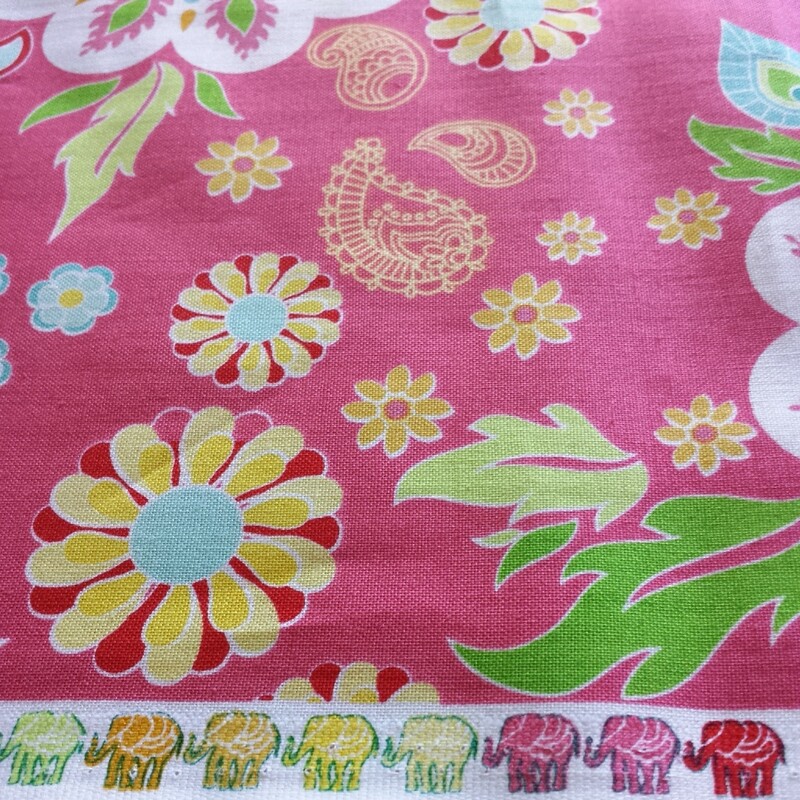 Did you get your newsletter from Winter Creek Cloth last week? Every time I get mine, I just want to buy one of everything! I'm really liking the Modern Solids by Jason Yenter! You may have noticed that they're giving away some Halloween fabric, and the winner gets to choose between two different lines - The Boo Crew by Sweetwater or Not So Spooky Halloween by Jennifer Heynen. All you need to do is reply to their newsletter with the word QUILTS in the subject line. If you don't get their newsletter, go ahead and sign up now, and send them an email with NEWSLETTER QUILTS in the subject line. Some of you may remember the Make It Right Challenge earlier this year that was hosted by Art Gallery Fabrics. You had to use the Right Angles panel by Angela Walters and Pure Elements solids to make something awesome. I had this crazy idea that I might like to try it, so I bought my Right Angles panel and then thought about it over and over and over again while I was busy making my mom's Mother's Day Quilt and my Relay For Life Quilt. 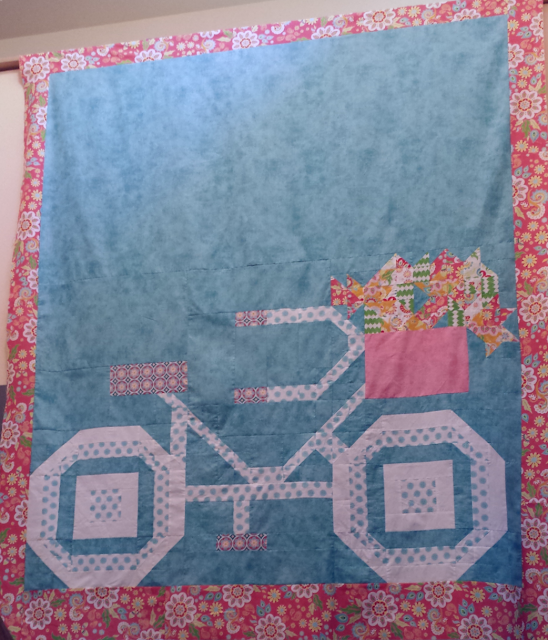 I'm not sure what made me think that I could possibly get anything else accomplished while making these two quilts AND working 40 hours a week. But I decided I would make it when I returned from my Mother's Day vacation in South Carolina. Then I got sick.....on the last day of vacation. And I was down for about two weeks. The challenge was not going to happen....for me anyway. However, my friend Kelli of Seriously..I think it needs stitches was all over this challenge and immediately got to work on a design. Her design was so awesome that she won first place!! She was then contacted by Nedra at Triangles on a Roll and asked if she would make one using their product. You should probably read Kelli's blog posts, starting with this one, of how everything just fell into place. I offered to be a pattern tester for her using Triangles on a Roll. I decided to make mine out of Madhuri (The Quilted Fish for Riley Blake). I love this fabric so much! All of it. And I especially love the selvage! These elephants are so flippin' cute!!! Triangles on a Roll are pretty awesome. And so easy to use! 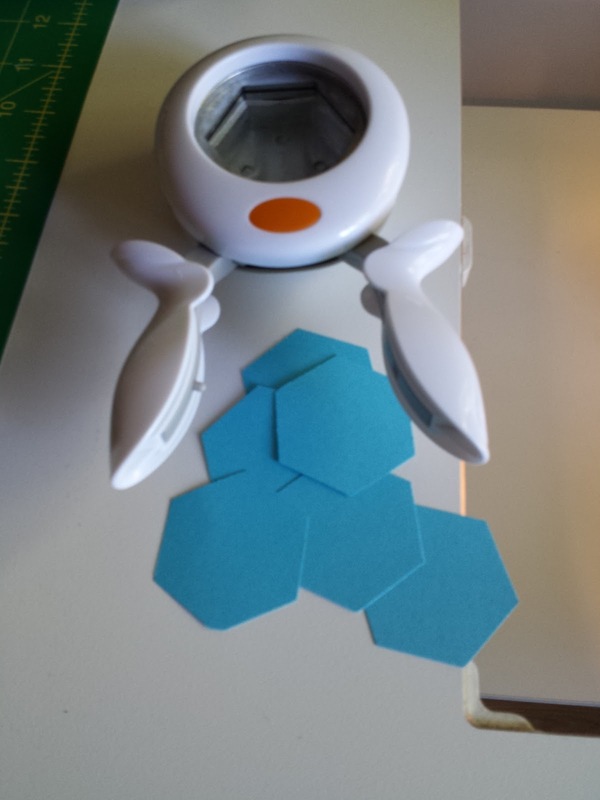 I personally am not a big fan of tiny half square triangles, but this made it so much easier! And putting together all of those little HSTs was so much fun! 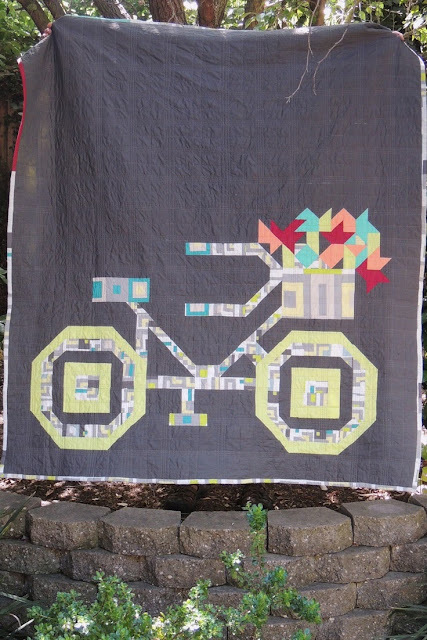 There are a lot of pieces to this quilt, but it's so worth it! I mean look at this thing! It's so cool and so different! Each Mod GeoCruiser quilt that has been made (2 by Kelli 1 by Nedra, and 1 by myself) has a totally different look. Nedra's can be found here. Kelli's latest can be found here. You may notice that their quilts are already quilted. Mine is not. That's because they sent their's out to have it quilted, and I'll be quilting mine on my home sewing machine. Heck! I might even try out some FMQ! Oh, and I'll probably be putting one of these cute little elephants on the basket as soon as I figure out how I want to do that. Kelli's latest Mod GeoCruiser quilt made with Gracie Girl (by Kassidy & Lori Holt for Riley Blake) is at Fabric Fest right now! And it's going to Quilt Market in Houston next! Woo hoo! If you're interested in making one with your favorite fabric, or maybe trying a scrappy Mod GeoCruiser, you can purchase the pattern on Craftsy, Riley Blake (soon!) or Triangles on a Roll. If you make one, I know that Kelli would love to see it!